International Women’s Day has been marked on Wall Street with a stature of a young girl. 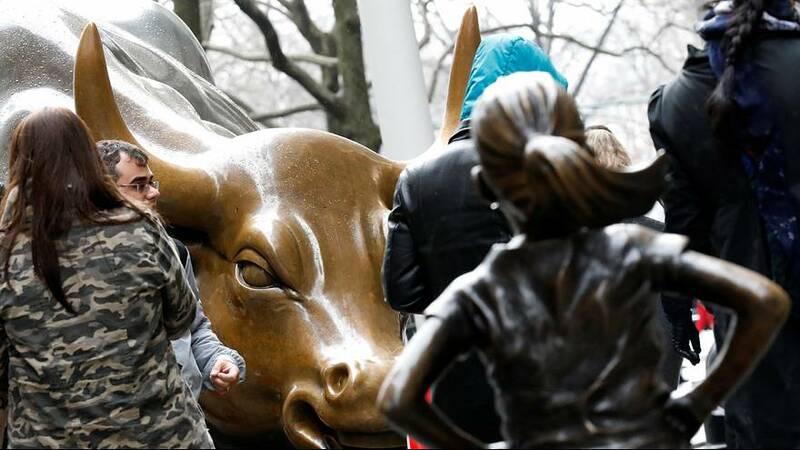 The defiant figure – called ‘The Fearless Girl’ by artist Kristen Visbal – was placed in front of the bronze charging bull located near the New York Stock Exchange. It was put there by an investment firm – State Street Global Advisors – which said the idea was to call attention to the lack of gender diversity in management of companies as well as how few women work in financial services, and the fact that they get paid less than men. Much the same as the charging bull, the statue of the girl was put up in the middle of the night as an act of ‘guerilla art’, State Street said. But, unlike the bull, the firm discussed it with New York city authorities beforehand so that it could remain at least temporarily. It is hoped the bronze statute will remain in front of the bull for around one month. The bull, sculpted by Italian-born artist Arturo Di Modica, was initially taken down after he placed it in front of the New York Stock Exchange in December 1989 without permission. But it was later given a permanent home, about a five-minute walk away on Broadway, in response to public support. It is a reference to when stock markets are racing ahead as opposed to a bear market when share prices are falling.